Every year, like clockwork, those allergies seem to act up. Did you know that your heating, ventilation and air conditioning (HVAC) system can actually make matters worse if not properly maintained? On the flip side, proper precautions, if taken, can actually help you ward off allergies that can be pesky and tough to get rid of. With allergy season here, you have enough to worry about with pollen and other allergens in the air, which often can send you into a sneezing frenzy. You want your home to be an escape from that, not yet another obstacle. Not only does keeping your HVAC system maintained improve performance, it ensures that your home is a safe haven during allergy season and beyond. If there’s ever any doubt regarding the quality of your heating, ventilation and air conditioning system, it’s always best to call a Portland HVAC professional. They can come in, survey the situation and recommend the best call of action to move forward with the most efficient system possible. 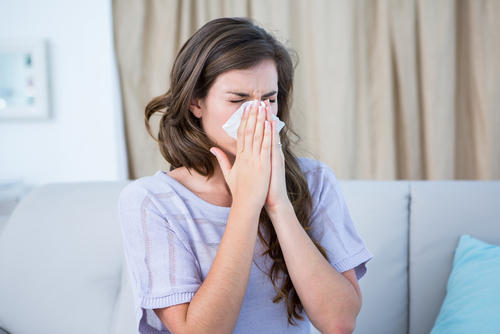 According to an article from Everyday Health, “Indoor air pollution levels are actually much higher than those outdoors — two to five times higher, says Julie McNairn, MD, an allergist and immunologist in private practice in Middletown, Ohio.” This disputes a common idea that escaping the outdoors removes you from potential allergy dangers. If your HVAC system and ductwork are not properly cleaned and kept up, your problems can continue inside the home as well. Pollen: Pollen can enter your home through open doors and windows, and can become embedded in carpeting and furniture. Dust Mites: It’s pretty impossible to keep your home completely rid of dustmites, and the same goes for your HVAC system as well, which is why regular routine maintenance is pivotal to ensure that they aren’t a problem. Laziness can lead to dust mite buildup, which could become a bigger problem if not maintained in the long term. Pet Dander: With so many people being allergic to either cats or dogs, we need to keep up with their shedding hair, drool, urine stains, and other contaminants. Since they’re part of the family, we’re not just going to get rid of them because someone we know is allergic. Odds are, if someone in the home is allergic, it’s not the best place for a cat or dog in the first place, although someone may want to choose their furry companions instead of their human friends sometimes. Mold and Mildew: Many types of mold can trigger allergic reactions. Often times, damp conditions are present when mold and mildew are a problem.This includes humidity and water leaks. Bacteria and Viruses: If bacteria and viruses have infiltrated your HVAC system, they can be easily transmitted throughout the house via air ducts. This could ultimately lead to Sick Building Syndrome, which leads to a variety of ailments to the inhabitants of the home. There are several tips on how to keep your HVAC system maintained, but it all starts with making sure you have a clean air filter. Flat Panel Filters: Designed to protect the furnace, not improve indoor air quality. Medium Efficiency Filters: Higher surface area, and therefore, filter more particles out of the air. High-Efficiency Filters: Remove even smaller particles than pleated filters. HEPA Filters: Usually not recommended for home use unless major EXPENSIVE updates are made to the system. They are so efficient that they require more energy to power the fan that circulates the air. Obviously, the higher the quality, the higher the cost. But instead of thinking about it as a large investment one time, it’s best to consider the long-term saving associated with the costs of maintenance and repairs if you don’t have high-quality filters. You may want to consult with a Portland HVAC professional for your specific unit, but investing early can save you a lot in the long run, both in terms of money, headaches, and allergy concerns. Don’t forget about your ducts as well. Have them routinely cleaned and maintained, because, if ignored, things like dust, dirt, and mold can accumulate, which could be a problem for those with allergies. Also, it can create a disgusting odor that will not be attractive to the home’s inhabitants, as well as visiting guests. Also, make sure your heating or cooling system’s evaporator coil is cleaned on an annual basis to avoid mold build-up. What is this piece exactly? The evaporator coil is an underappreciated component with an important job as it supports your heat pump and air conditioner’s functionality and can be found on top of your furnace. When in doubt, it’s always best to call a Portland HVAC professional to come on down and take a look at your heating and ventilation system. Before contracting these businesses on any kind of job, ask for references so you know that they’re respected and reputable. If they’re true professionals as one would hope, they’ve been asked all the questions that you’ll be equipped with related to cost, time for work, maintenance details and more. They should be there to make your life easier. If you find that using them seems like more of a chore, maybe it’s best to go in a different direction. The bottom line? You need to keep your HVAC systems maintained because your home should be a place you breathe easily.